Croft Castle was founded as a Norman earthen stronghold near the border of Wales, near the iron-age hill fort at Croft Ambrey. 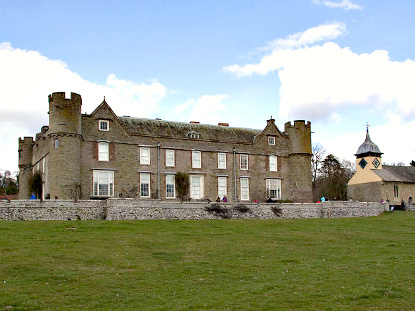 The castle as it can be seen today was errected around 1400, and was converted into manor house in the 16th century (the walls and towers were perforated to create windows). Its ostentatious interior dates mostly from the 18th and 19th century. The story of the Croft family starts in 1100 with Jasper de Croft, knighted during the First Crusade (see Bouillon) and Bernard de Croft, who according to the Doomsday Book, owned the land around the castle in 1103. In the 13th century, the Lord of Croft helped the captured Edward I to escape to Croft. In 1461, the battle of Mortimer's Cross, that saw the final victory of the Yorkist over the Lancastrians in the Wars of the Roses, took place on the land of Croft. The Crofts sided with the King during the Civil War, and the Royalists had to dismantle the castle to prevent the Parliamentarians from using it. In 1746, the indebted Croft family had to sell the castle, which was acquired by Richard Knight. The Trustees of Sir James Croft bought the property back in 1923 and the castle is still occupied by this family nowadays. Croft Castle consists of a large, square, brown-stone building. Its rough external appearance is balanced by its opulent Georgian interiors and furniture, notably its grand staircase and fine plasterwork. The castle has a walled garden, kitchen garden, tea-room and the main park is lined with an avenue of splendid 350-year-old Spanish chestnut trees. Croft Castle is open from 1:30pm to 5pm from Wednesday to Sunday between May and September, as well as week-ends in April and October. The gardens are open during the same period from 11:30am to 5pm, while the park is open daily, all year round. Admission to the house is £4.40 for adults and £2.20 for children. Entry to the garden is a separate £3.10/£1.50, but you can purchase a joint ticket with Berrington Hall for £6. The nearest train station is Ludlow (14km north) in Shropshire. Bus No 492 running between Ludlow and Hereford stops at Gorbett Bank, 3.5km away. By car, take the A49 between Hereford and Shrewsbury, then the A4110 at Mortimer’s Cross. 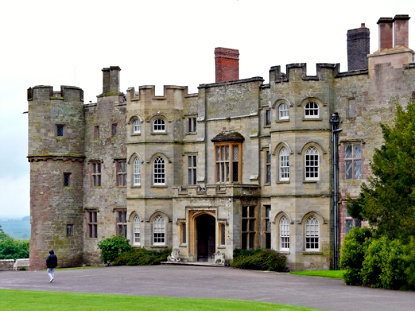 Croft Castle is about 8km northwest of Leominster, on the B4362.